Seahawks coach Pete Carroll and general manager John Schneider have long seen value in acquiring players who, for one reason or another, play with a chip on their shoulders. Whether it’s draft status, physical stature or some other perceived slight, some of the Seahawks’ best players in recent years have thrived on proving people wrong. So it’s only fitting that one offseason acquisition that the Seahawks are counting on to make a difference in 2018 is a player who overcame a lot of obstacles to get to this point in his career. 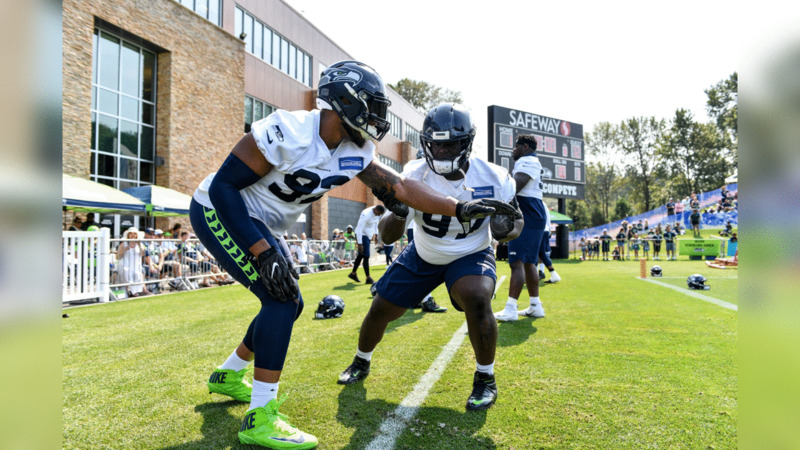 Tom Johnson, one of two former Minnesota Vikings, along with Shamar Stephen, that the Seahawks signed on consecutive days in March to bolster their defensive line, traveled a long and unusual road before establishing himself in the NFL. Johnson went undrafted out of Southern Mississippi—and that was after two years of junior college football—then after being cut by Indianapolis as a rookie, he was re-signed by the Colts the following year then assigned to the Cologne Centurions of NFL Europe. Johnson also played in the Arena Football League with the Philadelphia Soul and Grand Rapids Rampage, then joined the CFL’s Calgary Stampeders. In 2011, five years after he went undrafted, Johnson finally made his NFL debut, appearing in 13 games with the New Orleans Saints. Johnson has since carved out a solid career, appearing in 102 games over seven seasons, including 15 starts for the team that allowed the fewest points and yards in the league last season. Established or not, the 33-year-old Johnson still has the same chip on his shoulder that helped him fight his way through three leagues before reaching the NFL. “It’s the foundation of who I am on and off the field, just because of where I came from,” Johnson said. “That’s how I approach every day, I approach every day like I need to be productive, I need to do something. If I’m not getting better, I’m taking a step back. I take the same approach out here, I see that there’s guys who feel that same here, guys bringing their lunch pail to work every day, grinding, running. Carroll has really come to appreciate Johnson's attitude since the he arrived in Seattle, so much so that he wishes the Seahawks would have signed him a lot earlier than they did. Stephen, 27, took a more conventional route, though as a seventh-round pick in 2014, he too had to fight to stay in the NFL and maintains that mentality even after four seasons, including one as a starter in 2016. Together, Johnson and Stephen are expected to bring a veteran presence to what otherwise is a relatively young line following the offseason departures of 2017 starters Cliff Avril, Michael Bennett and Sheldon Richardson. In June, Carroll went more in depth on what those two had shown to that point, noting that Stephen had impressed even while unable to take part in on-field workouts—he has since returned to health and practiced throughout camp. Though both are listed as defensive tackles, Stephen and Johnson will have different roles on Seattle’s defense. Stephen is more of a run-stuffing tackle who could contribute on early downs, while the Seahawks see Johnson more as an interior pass-rusher who can help in nickel packages. Both will have to continue to prove themselves to cement themselves in those roles, but the early returns have been encouraging.